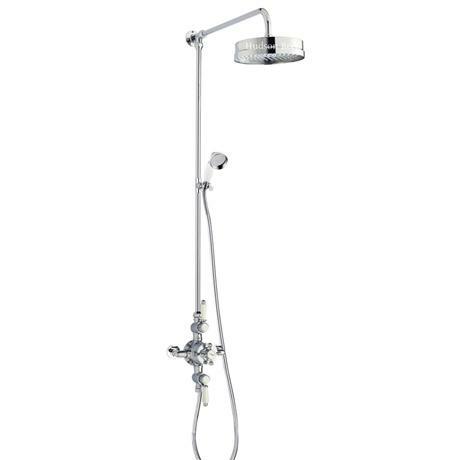 The Traditional triple thermostatic shower valve is robust and graceful and this strength of design is equalled by the depth of choice of shower heads & kits. Suitable for all types of plumbing installation this shower valve has the added safety benefit of a built in anti scald device should the cold water supply fail. Additionally this valve has a safety button stop at 38 degrees centigrade for safe showering which requires a conscious decision to over-ride to higher temperatures. For total flexibility, complete the look of your bathroom with a Designer shower kit. All kits include sliding rail, shower hose and shower head. Diameter of the main shower head is 8"
I was really made up with this shower kit, it included the sliding rail, shower hose and shower head and all at a really amazing price. I was told about the quality of the products from Victorian Plumbing by my friends and they were right. This shower kit is of a very high standard of quality. I will be returning to the website shourtly for a new bath and accessories. I went for this product due to its fantastic quality and this was by far the cheapest price online. I couldnt be more happy with it, thanks guys!